For some people, Super Bowl Sunday is about football. But for all people, Super Bowl Sunday is about snacks. Unfortunately most game-day party foods fall, nutritionally speaking, more than a few yard lines short of a first down. With a few smart substitutions and additions, it’s actually not hard at all to remake your favorites so that they are better-for-you and, if you ask me, better tasting. Take the classic Tex-Mex-inspired seven-layer dip with chips. Traditionally it’s made with shredded cheese, sour cream, black olives, refried beans, guacamole, salsa and maybe ground beef or shredded lettuce. I can’t argue with the yum-factor here—who doesn’t love beans and guac? 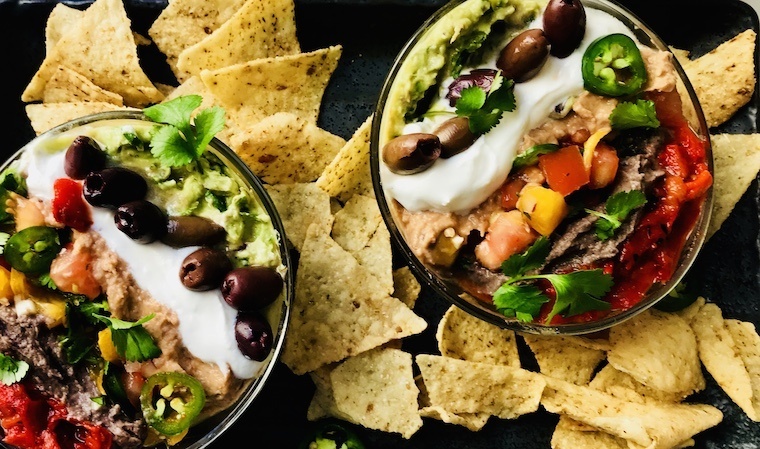 But by swapping coconut yogurt or Greek yogurt for the sour cream, ditching the cheese for another layer of beans, and making everything with fresh ingredients, the dip is not only mega-tasty, but also loaded with vitamins, fiber, and protein. Basically, it’s the Tom Brady of your snack spread. Basically, it’s the Tom Brady of your snack spread. You can serve the dip with whatever you like—raw veggies or pita chips—but lately I’ve been digging the probiotic-rich Kraut Krisps from a California-based company called Farmhouse Culture. The chips taste like tortilla chips but are made with sauerkraut and contain, according to the company, 1 billion active cultures per serving. I’m always looking to increase my consumption of gut-healthy probiotics and these chips are a pretty tasty way to do that. Want to try the dip for yourself? Keep reading for the recipe. You can use Greek yogurt instead of coconut yogurt if you aren’t vegan or dairy-free. Feel free as well to adjust the amount of jalapeño or chiles you use to make the dip. Canned green chiles work just as well as red, but I love the taste of these chiles from a New Mexico-based company called Los Roast. I order jars by the half-dozen because I add them to everything from omelets to curries. 1. In a pan lightly coated with coconut oil over medium heat, add black beans, cumin powder, and pickled jalapeño juice and pepper. Cook, stirring frequently, five minutes. Transfer to high-powered blender and blend until smooth. Season to taste with salt. Set aside. 2. In a pan lightly coated with coconut oil over medium-low heat, add the chopped red onion. Sauté until onion is soft and translucent, about five minutes. Add pinto beans and Tabasco and continue to cook, about five minutes more. Transfer to high-powered blender and blend until smooth. Season to taste with salt. Set aside. 3. In a bowl, combine the chopped red onion, avocados, chopped jalapeños, lime juice, and chopped cilantro. Mash with a fork until well combined. Season with salt to taste. Set aside. 4. In a small bowl, add coconut yogurt and lime juice. Stir the combine. Set aside. 5. In a bowl, add tomatoes, remaining red onion, jalapeño, cilantro, and scallions. Stir to combine, season with salt to taste and set aside. 6. Assemble dip in two small bowls or one large bowl. To layer vertically, start with the two kinds of beans, guacamole and salsa. Create small pockets with a spoon for yogurt, olives and red chiles. To layer in a bowl start with black beans, then add red chiles, brown beans, guacamole, yogurt, salsa and olives. Serve with chips or veggies of your choice. If you’re looking for more Super Bowl snacking inspo, Check out the recipes for this inflammation-fighting turmeric and cashew dip or these recipes strait from Tom Brady’s chef.